The Hotel Vier Jahreszeiten Kempinski Munich is minutes from the State Opera and Hofbrauhaus; with the main square Marienplatz and nearby Viktualienmarkt just further along. Since 1858, guests from all over the world have enjoyed the royal lineage of this glamorous grand hotel, originally built for King Maximilian II. Located among luxurious shops in the most elegant part of the city, Munich's popular sights and attractions are just a short stroll away. The 305 lavishly designed guestrooms and suites were carefully updated throughout the centuries, never losing its inimitable charm and rich history. Elaborate canvases adorn the walls and ceilings of the hotel’s guestrooms, suites, and hallways. From the private collection of the royal Wittelsbach family, these works of art are displayed in Munich’s Old Pinakothek Museum and enlarged for the Hotel Vier Jahreszeiten exclusively. Young Bavarian Cuisine awaits at the Schwarzreiter Restaurant & Bar, including Kempinski signature breakfast, praised as the "best breakfast in town" by many. For generations, the lobby of the Vier Jahreszeiten and the attached Jahreszeiten Bar, furnished in the traditional English style, have been a meeting point for the society of the city. Head to the enchanted paradise of Kempinski The Spa on the top floor to take in the stunning city skyline views and state-of-the-art facilities. Hotel Vier Jahreszeiten Kempinski Munich, a member of Historic Hotels Worldwide since 2016, dates back to 1858. Considered to be the best place to hold events, in 1859 guests celebrated the 100th birthday of the poet Fiedrich Schiller. By 1889, the hotel had electricity in the form of 1000 light bulbs and in 1890, telephones were available to guests. Parking: On-site parking: Available; surcharge. Self-parking: Available; surcharge. Secure: Available. Covered: Available. Payment: All forms of payment are accepted. Payment is required at time of booking. Visa, MasterCard, Amex, Diners Club, JCB, and China Union Pay are accepted. Pet Policy: Service animals allowed: Yes. Pets allowed: Yes. Dogs only. Fee: 100 EUR pet stay. Transportation: Limousine service may be arranged through the concierge; rates apply. 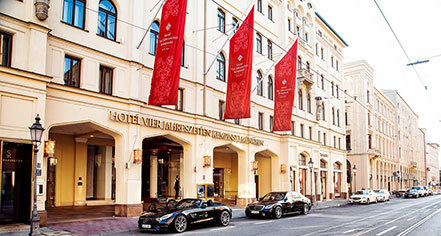 The Hotel Vier Jahreszeiten Kempinski Munich is minutes from the State Opera and Hofbrauhaus; with the main square Marienplatz and nearby Viktualienmarkt just further along. Since 1858, guests from all over the world have enjoyed the royal lineage of this glamorous grand hotel, originally built for King Maximilian II. 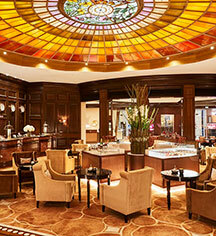 Learn more about the History of Hotel Vier Jahreszeiten Kempinski Munich .